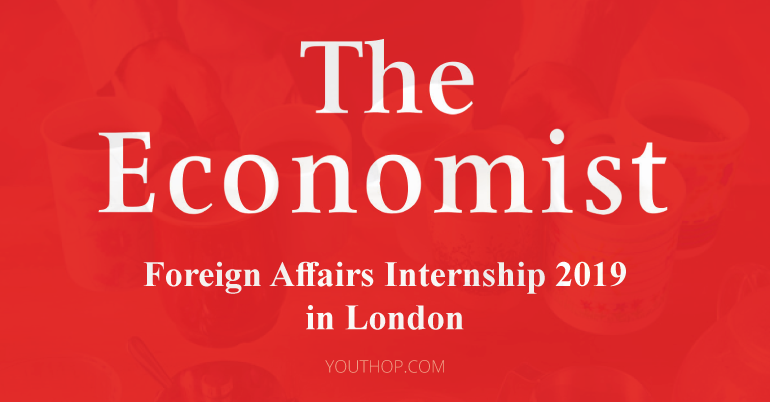 The Economist is looking for interns in London. The people at The Economist are seeking an intern to write about foreign affairs for The Economist. The internship will be London-based and will pay £2,000 per month. Anyone is welcome to apply, regardless of ethnic origin, gender, religious beliefs, disability, sexual orientation or age. Applicants should send an original unpublished article of up to 600 words suitable for publication in The Economist’s foreign pages, a CV and a cover letter to [email protected] The deadline for applications is April 15th, 2019. The aim of the internship scheme is to find and train future Economist journalists. Previous experience is not necessary. Rather, the organization is looking for raw talent. Candidates should have a boundless curiosity about the world and the ability to write about it concisely, wittily and with analytical rigor. Interns will be paid £2,000 per month. Open for anyone regardless of ethnic origin, gender, religious beliefs, disability, sexual orientation or age. Anyone can apply for the internship, regardless of ethnic origin, gender, religious beliefs, disability, sexual orientation or age. Applicants should send an original unpublished article of up to 600 words suitable for publication in The Economist’s foreign pages, a CV and a cover letter to [email protected] The deadline for applications is April 15th, 2019.